Freedom was born in our home. He is a son of my dear Katie. He's a wonderful dog with a great temperament and has always passed his sweet disposition and good looks to his pups. I went through a period of trying to restructure my kennel. Since I had Katie, I decided to sell freedom. 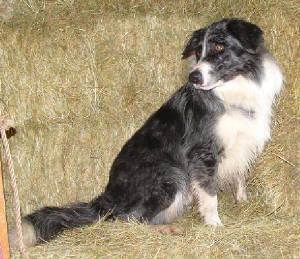 He was purchased by a working farm in Oregon where he stayed for over a year and sired a couple litters of pups. 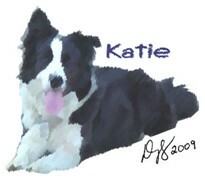 When Katie was killed, I offered to purchase him back. He was taken to Georgia to stay with a friend until I could get him all the way down here. He was hurt somewhere, somehow and isn't the stud he used to be, but he is still a very good dog. I am really hoping to get a good litter out of him by Tyler so that I can keep a female pup from the litter. Otherwise, I do have Malachi, his son, who has been a wonderful gift to us. Freedom is being retired and is currently for sale to a PET only home. Tyler is due to come into heat next month. I will attempt to breed her with him if he is still here. If he sells, I will put her with Monk. FREEDOM AND SPLASH WAITING AT FRONT DOOR TO COME INTO THE AIR CONDITIONING AFTER CHASING OUR PIGS. Freedom is a gorgeous dark blue merle stud. He is a son of our beloved Katie and was bred on our farm. He has a very kind, loving and gentle disposition. He is sensitive and, though he has plenty of ability and instinct to work stock, and though he had a great start, he was terrorized and ruined by a fairly well known local trainer I took him to when he was only 14 weeks old. 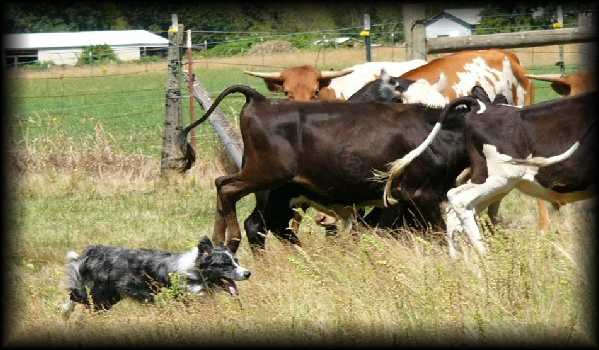 He now has permanent herding issues instilled in him that even Bill (Oregon) could not overcome. Bill is a professional dog trainer on many levels and in many areas. He lives in Oregon and raises and trains his own stock dogs and works longhorn cattle, sheep and hogs. Bill bred Freedom a couple of times with nice pups to his credit. The last time he bred him, no litter was produced. Anyway, running cattle through the wilds of Oregon did not go well with Freedom's lush and very thick coat and was not condusive to easy keeping. I missed Freedom and asked Bill if he would return Freedom if I sent him a nice medium coated working female to replace him. He agreed, and Freedom came home! He took a brief detour to a friend's kennel in Georgia to breed one of his females, but by the time Freedom got there she had gone out of heat. Freedom has not sired a litter since except for his one son, Malachi. He was tested and has a very high and viable sperm count, but he's just not up to the task. I no longer have my Katie, but I do have Freedom her son, and Malachi, his son. FREEDOM WORKING LONGHORN CATTLE IN OREGON ON THE WOODY ACRES RANCH. 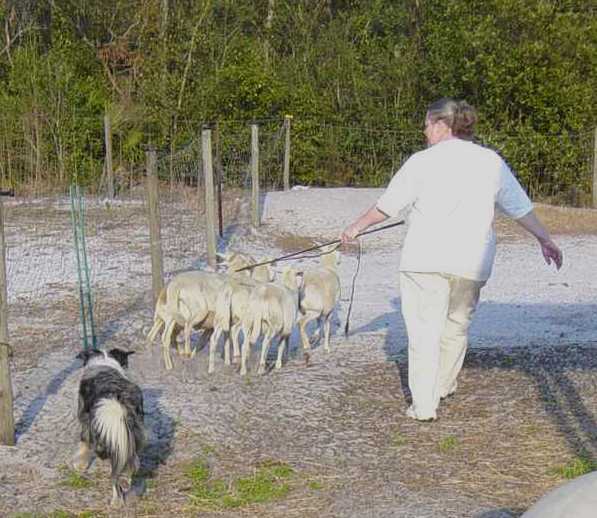 FREEDOM IN TRAINING WORKING SHEEP WITH ME IN FLORIDA BEFORE HE WENT TO OREGON. These were taken in Georgia at a friend's kennel before coming back down to Florida. These photos were taken since he came back home. Last updates to this page 9-19-10.